Growing Up On the Farm - Hauling Corn Crop to Market at Age 13. 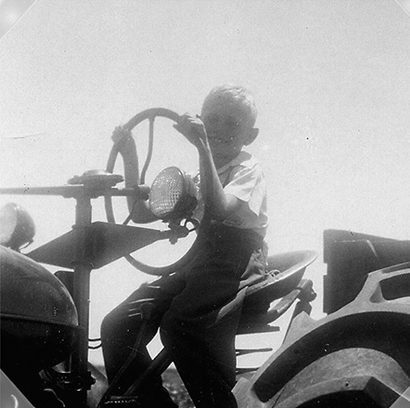 In the 1940s & 1950s"
Farm parents looked for opportunities to give their children meaningful jobs to do. At a young age we started with simple chores, which grew more complex as we grew older. When I was a child, a farmer used a planter mounted on a tractor to plant seed and cover the seed with freshly plowed dirt. One problem was the loose dirt covering the seed would quickly dry out and not leave enough moisture for the seed to germinate. So to retain the moisture, the dirt needed to be compacted, like you would if you planted seed in your flowerbed and patted it down with your hand. 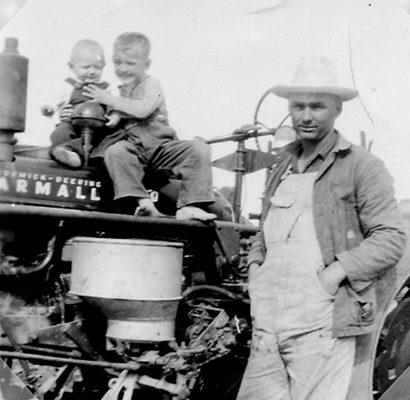 "Henry, Robert and Dad with Farmall H Tractor"
"Hauk's Hybid Seed Corn Sack"
Which Dad Used Before I was Born"
But it wasn't that simple. If you compacted the dirt immediately after the planter covered the seed, the surface dirt was so damp that that it would stick to the compacting wheel and actually dig up the seed you were trying to plant. So we waited a couple of hours, or overnight, before we compacted the soil covering the newly planted seed by rolling it. We kept two mules and used them to pull the rollers. 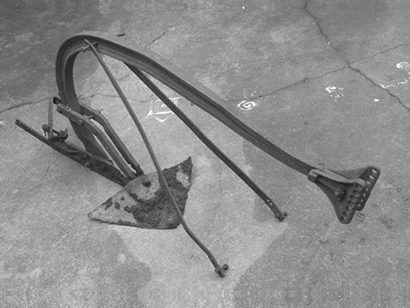 Robert would harness my mule, Jennie, and hook her up to a two-row roller and then he would do the same for his mule, Brownie, who would pull the four-row roller. I was about six, so we would always work in the same field and Dad threatened us both with our lives if he caught us racing the mules. We may not have actually raced them but we may have encouraged them with a few Giddy Ups once in a while. I�m quite sure those mules were very obedient to the stern commands from a 6 year old and an 11 year old kid. Dad said if I ever had a problem controlling my mule I was to turn around and just hop off the back of the roller since the mules could not easily back up while hitched to the roller. One day one of the reins on Jennie�s bridle came lose and I had no way to control her. So just like Dad had told me, I turned around and hopped off the back. When Jennie got to the end of the row she stopped and waited for directions on which way to turn. Robert came over and reattached the rein so I could continue. Those mules knew more about farming than I probably ever did. Until the time I was about 8, ripe corn was harvested by physically yanking the ears from the cornstalk and throwing them into a pile to be picked up later. This is the way it had always been done. Corn stalks are taller than the workers so there would be no air circulation in the middle of a corn patch in late July. This would be very hot, physical work. I was not strong enough to pull the ear of corn off of the stalk when I was that young. 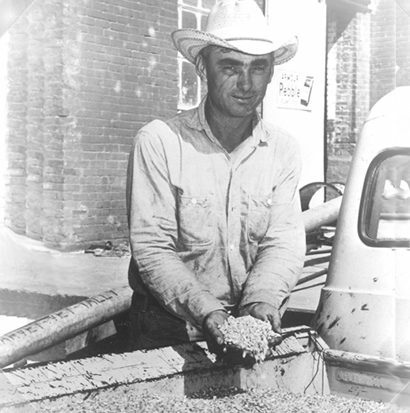 Once the corn had been placed in piles I would go along to the field with two workers, one of them would be my Dad. My job was to drive the mules, which were pulling a trailer, up to the piles of corn. The two grown ups would toss the ears of corn from that pile into a washtub and dump the tub into the trailer. I would then pull up to the next pile of corn and they would repeat putting the corn in the washtub and dumping it into the trailer. By the time I was 10, a small tractor had replaced Jennie and Brownie. Like I said, everything was changing very quickly and it cost too much to feed the mules if you weren�t going to use them more than three or four weeks a year. 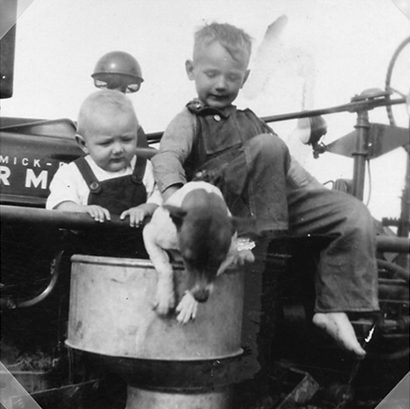 "Henry, Robert and Max on Tractor"
"David - Happy as a Pig in Slop"
One learns to drive at a young age on the farm. It starts with small tractors and just sort of builds from there. Dad had a two-row corn-picking machine by the time I was in junior high. When I was 13, Robert was out of high school and working at the cotton gin in town, so it was going to be my job to haul the corn crop to town to be sold. I could not get a driver�s license until I was 14 but it was legal for youngsters under 14 to drive a tractor on the public road. So Dad decided I would use a tractor to pull trailer loads of corn to town. We had a large tractor that would run about 20 miles an hour but at that speed I wouldn�t be able to haul the crop to the granary on the far side of town as quickly as the corn picker could gather it. Dad decided I would be able to keep up if he hooked two trailers together. A route through town was selected and a notch on the tractor throttle was marked for the speed I was to drive. All went well and everybody in Rosebud got used to seeing me come through town back and forth on those back streets about four round trips a day. Of course, I felt like pretty big stuff whenever I saw a school friend from my perch high up on that big tractor. Since the trailers were only used for about 6 weeks per years, the tires seldom wore out. However, they would eventually rot and it was not unusual to have a flat tire on those rocky gravel roads. 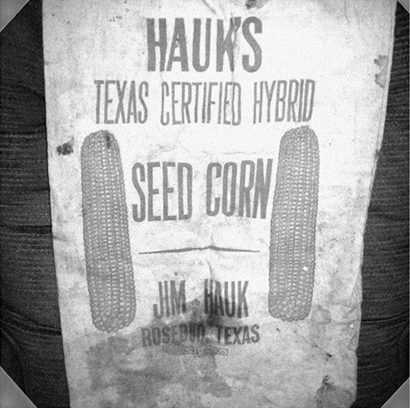 There was a jack in the tractor�s toolbox and I threw a spare tire in each trailer after it was filled with corn. I would usually have about three flat tires a week and with a little practice, I got to where I could change a flat in about 10 minutes. I would take the flat tire to Huddleson�s Humble gas station where my school friend Jackie worked and he would fix the flat. When the tires were no longer repairable Dad would buy used tires to replace them because they would rot before they wore out anyway. One day near the end of the harvest during my 13th year (note: my birthday was in May so I was just barely 13), I was pulling two trailers loaded with corn to town with the tractor. The county maintainers (us country folks call it a road grader) had graded out the ditches for better drainage. The gravel roads had one set of tracks down the middle with loose gravel on both sides and I pulled into the gravel to meet a car coming toward me. The first trailer �whipped� a little in the loose gravel and the second trailer skidded into the steeply graded ditch and turned over. At that moment I discovered I could really stop quickly. At least it was ear corn and not shelled corn. I used my cell phone to call home � wait just a minute, there wouldn�t be any cell phones for another 35 or more years. I walked about a half mile to the nearest house and got the neighbor to call home. Mother got Dad out of the field and he came and got me. We returned home and got a big chain and an elevator with a gasoline motor. First we used the tractor and the chain to pull the trailer back upright. Then it probably took the two of us less than an hour, using the elevator, to reload the corn on the trailer. What is an elevator you ask? An elevator is kind of like a mini escalator only it is used to lift something like corn up a narrow chute (about one foot wide) and dump it when it gets to the top. It has many uses but the most common is to aid getting ear corn up to an opening high on the side of the barn. Farmers always kept some of the corn they harvested in a corncrib (which is just a room in the barn where corn is stored) for their own use. Without the elevator you had to pitch it up high through the opening one shovel full at a time. It was backbreaking work. So we stuck the top end of the elevator through the window in the barn. Then we backed the trailer up to the bottom end of the elevator and just pushed the corn out the back of the trailer. It would fall into the elevator, which would pull it up and dump it into the corncrib. Obviously another use of an elevator could be to reload a trailer that an innocent child had turned over. I do recall that Dad was a bit irritated that he was unable to finish the field he was harvesting until the next day. Otherwise it wasn�t a real big deal. I mean how fast could I have been going if the tractor didn�t go but 20 miles an hour wide open. I will admit (now) that it never occurred to me to let off on the throttle � even when I pulled into the loose gravel to meet that car. But there were some things Dad didn�t need to know. We raised a lot of corn and once I was 14, I got my driver�s license and could haul the corn to town using our pickup to pull a trailer. Now I could drive faster than 20 miles per hour. I still remember driving a little fast over a rough bridge one day and snapping off the huge bolt on the trailer frame, called the kingpin. The front tires of the trailer pivoted around the king pin, which allowed the trailer to turn corners. The entire load fell on the front two trailer tires and I came to another rather sudden stop right in the middle of that bridge. With practice, I was getting better and better at stopping really quickly. Remember the procedure where the state trooper asked you to jam on your brakes and stop quickly when you took your drivers license test? Well there I was out there all by myself developing all these new ways to stop quickly. Dad constructed a really well built trailer to haul the shelled corn to town. He built it tight so it would not leak the corn kernels and strong so it would handle a heavy load. And it had dual wheels on the back axel. Just a note about building a trailer - when you wanted to build a trailer you went to a junkyard and brought the frame of an old car or pickup truck. No cab or engine or gas tank or stuff like that - just the frame, wheels and tires. The trailer was built on the car frame (or in this case - the heavy duty pickup frame with dualies) and a tongue was welded to the front axel so you could hook the trailer behind a tractor or pickup and pull it. The sideboards were bolted to 2 by 4 vertical studs. Dad would borrow an electric drill from the cotton ginner, Clarence Wolf, and drill holes through the trailer sideboards and the vertical 2 by 4 studs. Somebody had to stick the bolts through the holes that Dad drilled and then put on a washer and tighten the nuts on the bolts. I filled the role of that somebody quite well. And of course a young boy could always help paint a trailer because no one cared if the job wasn�t perfect or if you dripped a little paint on the ground. Dad or Robert would come along behind me and touch up any mess I made anyway. But that was done on pretty days in the wintertime, under that oak shade tree with the tree house in it, so it was more fun than work. The loaded pickup and trailer grossed out at about 14,000 pounds when both were loaded with shelled corn and it seemed as if it took about a quarter of a mile to stop, especially in loose gravel. I wouldn�t have been able to stop that quickly if Dad hadn�t filled the back end of the pickup with shelled corn so the pickup tires could get some traction. There was a spot where the gravel road T�ed into a paved Farm To Market road about two miles from town. Of course there was a stop sign there. I had to start stopping well before I got to that intersection and even then the trailer would try to push the entire load right past that stop sign. In reality I never quite stopped. Once I had slowed down to a couple of miles an hour and it was clear that I could stop if a car was coming (and there wasn�t a cop anywhere around) I would slam it into first gear and hit the gas because it was hard to get that sucker moving if I ever came to a complete stop. A couple of years later Dad bought a bob tailed truck (a one piece truck without a separate trailer � it had 10 wheels, not 18, and the bed had a hydraulic lift). By now I was about 17 and the truck loaded with corn probably grossed out at a little over 33,000 pounds. But it was much easier to get the truck rolling and also to stop than the pickup had been. Dad decided he could get a better price at the granary in Cameron that year, which was another 17 miles further, so I had to haul that crop through Rosebud to Cameron. At least the extra miles were on a paved highway. Once I got to Cameron I could dump the load really quickly with the hydraulic lift. On one of the early trips that summer I noticed in the side rear view mirrors that a lot of grain was blowing out the back of the truck at highway speeds. Then when I got to the granary in Cameron I checked the bed of the truck and it was obvious I had lost some grain. When I told Dad about it he said not to worry, but I did. After that I went into the tractor shed and got the big heavy tarpaulin and from then on when the truck was loaded I covered the corn with the tarp and tied it down tightly before I left the field. I was proud of the money I saved for my Dad that harvest. By then I was probably driving 55 miles per hour and the people I met on US77 that summer had no idea how lucky they were that their lives were being spared - on a road with a kid driving a truck - yet one more day. 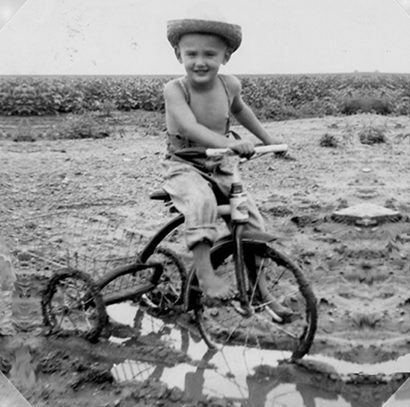 In case you�re wondering, a farm boy did not require a commercial license to drive his dad�s farm truck. Whenever I did not have a load of corn to drive to town, I was to shred corn stalks with the shredder pulled by our small Farmall C tractor. One day the truck was parked in the middle of a 150-acre field where I was shredding harvested corn stalks. It was late and time to quit for the day. At the end of the row I pulled the tractor up behind the truck and got off the tractor and into the truck so I could drive it to the house. Since the truck bed is behind the cab there is no rear view mirror in the middle of the windshield, only mirrors on each side of the truck. Earlier I had decided that I would always get out of the truck and look behind me before backing up just to be sure I never backed into anything. I started to get out of the truck to look behind me and then I thought, What could be behind me? I am in the middle of a 150-acre field? So I started the truck, threw it in reverse and backed into that Farmall C. Oops! Well Dad spent a little money doing minimal repairs on the tractor. The front end was a little crumpled but he got it running again. About a week later I drove that same tractor pulling the same shredder to the house for lunch. The truck was already loaded with corn and parked beside the road in the front yard waiting for me to drive it to town. I parked the tractor behind it and went into the house to eat with the family. When I finished eating I came out of the house and walked between the tractor and the truck and got in the truck. I needed to turn the truck around so I could head the other way, so I started the engine, put it in reverse and backed into that same tractor again. I never said I was perfect. I mean, I just backed that same truck into that same tractor two teensy weensy times. I have one more story about Dad and his combine I want to tell. Dad had just achieved a major life accomplishment (he didn�t call it that but we all understood that it was, anyway) and bought his first self-propelled combine that could harvest grain and pick and shell corn in the field. He was one proud farmer! He had finished harvesting our maize crop that first year but had a couple of weeks before he would start gathering his own corn so he was combining maize for a neighboring farmer. It was summer time and I was there helping position the truck and making myself useful doing any thing he might need done. It was closing in on 10:00 at night when Dad decided to shut it down for the day and go home and get some sleep. We came back the next morning and the first thing Dad saw in the bright light of day was a concrete pillar nestled between the maize stalks in the very next row he would combine. It was some kind of a county survey marker the landowner had failed to point out to Dad. If Dad had made one more round the night before, he would have run it up into his prized new combine and done a huge amount of damage. Whew! He never said so but I bet he was almost ill when he saw that concrete post. 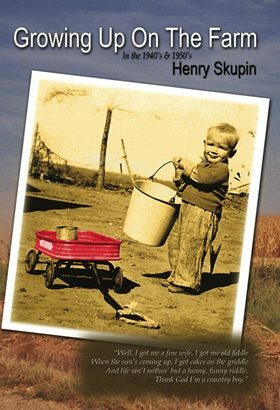 For a signed copy of "Growing Up On the Farm"
Country Boy on Regulators: Enron talked the SEC officials into allowing Enron to redefine how their profits were calculated. The SEC officials, who allowed this deviation from standard accounting practices, should serve jail time just like those people from Enron, maybe longer. And I have never heard of even one SEC official suffering any repercussions for their part in this business travesty.